An "iconic" tree on the Isle of Wight has been saved following a campaign. The weeping ash in East Cowes was facing the council axe because of concern it was unsafe due to a fungus. TV wildlife presenter Chris Packham, who joined the campaign group to stop the 100-year-old "Umbrella Tree" being cut down, said he was delighted. The council said it was working with the group after the public liability insurance needed to take ownership of the tree had been secured. Packham said: "Massive hats off to all the campaigners. "Too often our elected decision makers are failing to understand the importance that nature plays in people's lives and the need to invest in its conservation. "But this saga hasn't been about 'a tree' it's been about an attitude to life and a need to increasingly respect life, all life." Tanja Rebel, from the campaign group, said: "An iconic tree has been saved for all to enjoy." The group said it was now waiting for the authority to confirm its formal transfer request to take over the responsibility of the tree. It has formed a community interest company - The Friends of the Umbrella Tree - to take over the care and ownership of the tree. 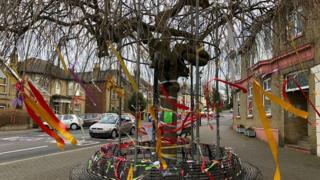 The group will also need to raise funds to pay for its maintenance and inspections and a framework to support the tree. The council said it would ensure "that safety is paramount".